Better to have a knife and not need it, than to need a knife and not have it. At the same time, you don't want to swim around with a Samurai sword strapped to your leg. This is where the MAKO STAINLESS excels. It is compact enough to easily strap to a leg or forearm or mount on a BCD, yet its large enough to hold onto with confidence when it's time to do some cutting. 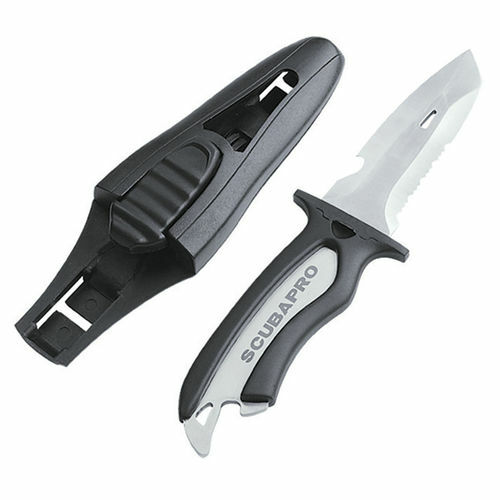 The MAKO’s multi-function blade has a serrated edge for sawing through rope, a conventional edge for making clean slicing cuts, a line-cutting notch, and a bottle opener. The Tanto tip, with its angled shape, is one of the strongest knife points available and, combined with the different blade edges, makes the MAKO STAINLESS an excellent general-purpose dive knife.